The problem is rooted in the very structure of capitalism itself. Cost-shifting is an essential feature of the capitalist mode of production. An electric power company burns coal to generate electricity because the price per kilowatt hour from coal-fired electricity has long been cheaper than alternatives. But the emissions from burning coal travel downwind and cause damage to the respiratory systems of thousands of people — including preventable deaths to people with respiratory ailments. This is in addition to the powerful contribution to global warming from the carbon dioxide emissions. But the power firm doesn’t have to pay money for these human costs. If the firm had to pay fees that would be equivalent to the human cost in death, respiratory damage and contribution to global warming and its effects, burning coal would not be profitable for the power company. Power firms that generate vast amounts of carbon dioxide emissions — and firms that make profits from building fossil-fuel burning cars and trucks or from the sale of gasoline and diesel and jet fuel — have not had to pay any fees or penalties for the growing build-up of the carbon dioxide layer in the atmosphere. The global warming crisis thus has its explanation in cost shifting and the search for short-term profits and ever growing markets — features that are at the heart of the capitalist system. Launch a “state-directed” crash program to phase in renewable electric power production, electric transport vehicles and other methods of transport not based on burning fossil fuels. Develop programs to shift from petro-chemical intensive industrial agriculture to organic farming. It’s also a mistake to romanticize the New Deal. People talk of the 1930s WPA as the model for “job guarantees” — that is, government as employer of last resort. But there was still 17 percent unemployment in USA as late as 1940. Workers in the WPA often had beefs such as low pay. Communists, socialists and syndicalists organized unions and strikes among WPA workers. The gains that working class people were able to win in the Thirties did not simply come about through electoral politics. Nor were the conservative, bureaucratic “international unions” of the American Federal of Labor the vehicle either. They were more of a road block — exactly why several hundred thousand workers had created new grassroots unions from scratch by late 1934. When rank-and-file working class people participate directly in building worker unions, participating in carrying out a strike with co-workers, or in building a tenant union and organizing direct struggle against rent hikes or poor building conditions, rank-and-file people are directly engaged — and this helps people to learn how to organize, builds more of a sense that “We can make change,” and people also learn directly about the system. More people are likely to come to the conclusion “We have the power to change the society” if they see actual power of people like themselves being used effectively in strikes, building takeovers, and other kinds of mass actions. In other words, a movement of direct participation and grassroots democracy builds in more people this sense of the possibility of change from below. When the strategy is focused on electing people to office in the state, college-educated professionals and people with “executive experience” will tend to be favored as candidates to “look good” in the media. And this means people of the professional and administrative layers will tend to gain leadership positions in an electorally oriented party. This will tend to diminish the ability of rank and file working class people to control the party’s direction. This is part of the process of the development of the party as a separate bureaucratic layer with its own interests. Because they are concerned with winning elections and keeping their hold on positions in the state, this can lead them to oppose disruptive direct action by workers such as strikes or workplace takeovers. There is a long history of electoral socialist leaders taking this kind of stance. To the extent electoral socialist politics comes to dominate in the labor movement — as it did in Europe after World War 2 — declining militancy and struggle also undermined the commitment to socialism. The electoral socialist parties in Europe competed in elections through the advocacy of various immediate reforms. This became the focus of the parties. Sometimes they won elections. At the head of a national government they found that they had to “manage” capitalism — keep the capitalist regime running. If they moved in too radical a direction they found they would lose middle class votes — or the investor elite might panic and start moving their capital to safe havens abroad. In some cases elements of the “deep state” — such as the military and police forces — moved to overthrow them. Most of these parties eventually changed their concept of what their purpose was. They gave up on the goal of replacing capitalism with socialism. 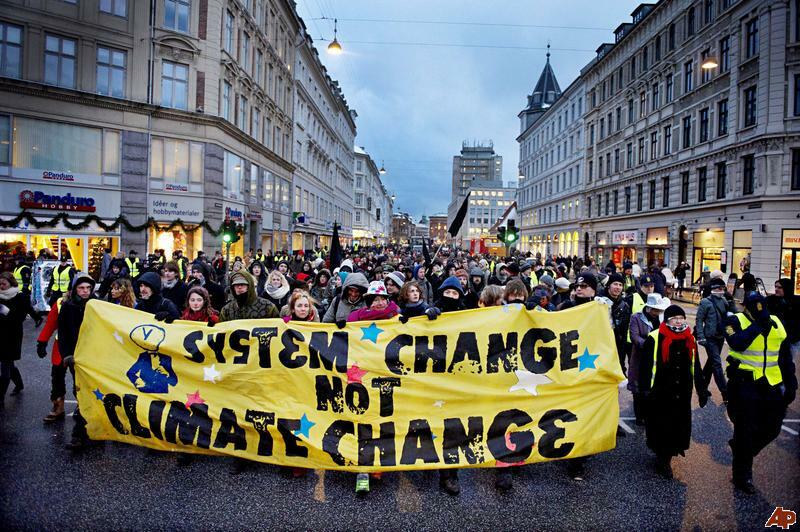 Worker and community organizations can be a direct force against fossil fuel capitalism in a variety of ways — such as the various actions against coal or oil terminals on the Pacific Coast, or labor and community support for struggles of indigenous people and other rural communities against polluting fossil fuel projects, such as happened with the Standing Rock blockade in the Dakotas. Unions can also be organized in workplaces of the “green” capitalist firms to fight against low pay and other conditions I described earlier. On the other hand, the syndicalist vision of self-managed socialism provides a plausible basis for a solution for the environmental crisis because a federative, distributed form of democratic planning places power in local communities and workers in industries, and thus they have power to prevent ecologically destructive decisions. For syndicalists, socialism is about human liberation — and a central part is the liberation of the working class from subordination and exploitation in a regime where there are dominating classes on top. Thus for syndicalism the transition to socialism means workers taking over and collectively managing all the industries — including the public services. This is socialism created from below — created by the working class itself. Syndicalist movements historically advocated a planned economy based on a distributed model of democratic planning, rooted in assemblies in neighborhoods and workplaces. With both residents of communities and worker production organizations each having the power to make decisions in developing plans for its own area, a distributed, federative system of grassroots planning uses delegate congresses or councils and systems of negotiation to “adjust” the proposals and aims of the various groups to each other. Examples of libertarian socialist distributed planning models include the negotiated coordination proposals of the World War 1 era guild socialists, the 1930s Spanish anarcho-syndicalist program of neighborhood assemblies (“free municipalities”) and worker congresses, and the more recent participatory planning model of Robin Hahnel and Michael Albert. I count myself as an eco-socialist, but there are various strains of this political philosophy. They range from the type of eco-socialism practiced in Venezuela and Bolivia, with a centralised government headed by a (male) leader, through to the Green New Deal proposals championed now by social democratic politicians in the US and UK (though first proposed by Green Parties in both these countries). To, at the other end, an anti-capitalist variety, to which I belong, which includes such figures as Joel Kovel and Michael Lowy, who co-authored the first eco-socialist manifesto. Nature contains billions of ecosystems, all connected in a finely balanced way, to form what we might call the ‘ecosphere’. Capitalism disrupts and eventually completely ruptures this balance, setting off chain reactions which cannot be cured easily, if at all. Human beings are ecosystems too, and the way the system forces us to live, causes a rupture between us and nature and leads to illnesses like stress, depression and obesity. And to those who say the ways of capitalism are ‘human nature’, then if this is true, why have we only been living this way for a few hundred years? The only thing natural about capitalism, is that it was invented by creatures of nature, us. And we can just as easily un-invent it – and we should. Eco-socialist writer James Bellamy Foster has managed to link this to Karl Marx’s notion of an ‘irreparable rift’ between humans and nature, in volume three of Capital. Historically, in Britain and other western nations, people were forcibly removed from common land as it was enclosed, with violence employed, to drive the people off the land and into the capitalist factories in the towns and cities. And today the same thing is happening in developing countries. By taking away people's alternative way of providing for themselves, they are left with no choice but to move into cities and work often 16 hours a day for meagre pay in factories, where health and safety is non-existent, and female workers are routinely harassed and molested. When I visited Senegal in west Africa a few years ago, one day I spoke with some fishermen who complained about the factory ships from the European Union, Russia and Japan that were hoovering up all of the fish, so much so, that the local fisherman couldn’t catch enough fish anymore to earn a decent living. Here was a system of managed commons which had fed local people for thousands of years and provided a livelihood for the fishermen, destroyed by the capitalist factory boats. Robbing from the poor - to give to the rich. You have probably heard of the ‘global commons’ on the internet, peer to peer sharing and free software, which eco-socialists welcome, with the possibilities it provides for living outside of the capitalist system, to some extent anyway. This is a quote from my favourite eco-socialist writer Jovel Kovel describing our vision of eco-socialism: ‘a society in which production is carried out by freely associated labour, and by consciously eco-centric means and ends’. I think this phrase covers the production process under eco-socialism neatly. The ‘freely associated labour’ bit refers to the absence of surplus value, profit for capital. Production would be for ‘use-value’, not ‘exchange value'. It will require useful workers only, doctors, nurses, teachers etc. and there will be no need for work such as pushing numbers around on a computer in a bank in the City of London, which is useless to humanity - and indeed harmful. What is produced will be of the highest quality, and beauty, and made to last and be repairable. My laptop packed up last week and I put it in for repair. But they couldn’t fix it because they couldn’t get the replacement part – this laptop is only a little over a year old, but it is obsolete. Throw it away, and get another was the advice. This is purposefully a planned obsolescence, to drive demand for new production within modern capitalism. In Green Party circles you hear a lot about sustainability, or sustainable production, but we eco-socialists prefer the word sufficiency, or sufficient production. Only as much as is needed will be produced, and no more. It should go without saying that the production process will be in balance with nature too. Democracy in an eco-socialist society will devolve all decisions down to the lowest possible level. A series of assemblies, local, town, regional and at least at first, national. The assemblies will be freely elected and each assembly will be subject to recall from the level below, and assembly members should serve only one term. Eventually, the central state will be dissolved. 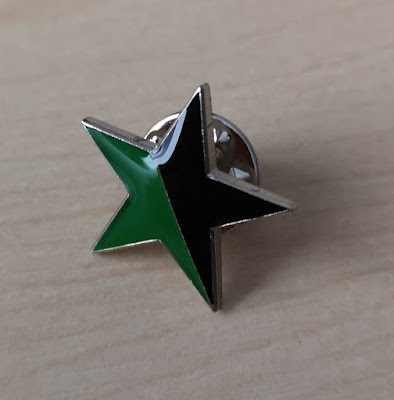 There are varieties of anarchism too, ranging from the individualist to collective types, but all tend to advocate horizontal leadership rather than hierarchical ones, and tend to pursue ‘statelessness’ as a central aim. Certainly at the left end of the anarchism spectrum the philosophy is anti-capitalist and truly democratic. 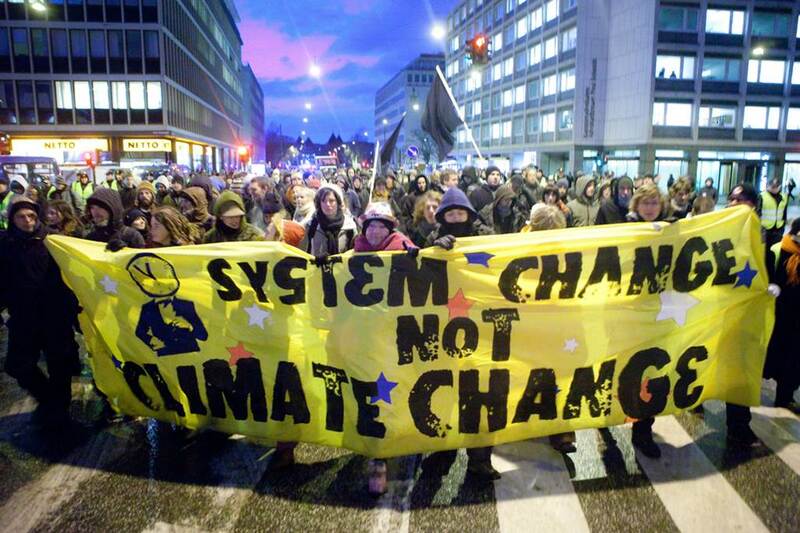 Eco-anarchism sits within the anarchist philosophy, it includes a critique of the interactions between humans and non-humans, as well just human ones and aims to bring about an environmentally sustainable anarchist society. Social ecology developed mainly by the writer and thinker Murray Bookchin, is part of this strain of anarchism and many eco-socialists count Bookchin as a part of our tradition. Bookchin was at first a libertarian socialist, but moved to a more unambiguously anarchist philosophy, though he thought Marx’s thinking and writing was valuable, and was mainly at odds with the Marxist academic establishment in the US in 1960s, who he accused of crowding out anarchist thinking. His ideas have been taken up and are presently being practised in the Kurdish autonomous region in northern Syria, known as Rojava. The Democratic Union Party and the Kurdish National Council, joined to form the Kurdish Supreme Committee and the People's Protection Units militia were established to defend their territory. Eco-socialists find great encouragement and inspiration from this experiment, and see it as very similar to what a future eco-socialist society might look like. There were disagreements between socialists and anarchists in the nineteenth century, with, for example, William Morris the British socialist, who eco-socialists count as one of our own, clashing with anarchists at the Social Democratic Foundation. But the divide really opened up in the twentieth century, mainly because of the successful socialist revolution in Russia and the way it developed, into a nasty authoritarian state with an empire of states around the world and a very powerful military. Eco-socialists hold the same sort of view as anarchists of this twentieth century, actually existing socialism, and think that the Russian revolution took socialism in the wrong direction, away from a truly libertarian path socialism had promised, and Marx wrote about. Marx’s ideas on ‘freely associated labour,’ was nowhere to be seen in the USSR or the other actually existing socialist states. I know that many anarchists are wary of socialists calling for ‘left unity’ and with good reason. Too many present day socialists are unreconstructed, and often shamelessly so, that eco-socialists despair of them too. So, I’m not really calling for a unity with these types of people and their philosophies, but I would ask that anarchists take a fair look at eco-socialism, particularly eco-anarchists. In my view, there are so many similarities between the two philosophies, and not many differences. In 2017, around £1 billion in UK renewable energy subsidies – paid out of a surcharge on our electricity bills – went to power stations burning wood. This is money which should go to genuinely low-carbon renewables such as wind, wave and solar power. Altogether, far more wood is being burned for electricity than is produced annually in the UK. Far from being green energy, biomass burning makes climate change worse, destroys forests and damages biodiversity. It also harms communities who live near wood pellet plants and biomass power stations and wastes bill-payers’ money on a false solution to our energy needs. Drax Power Station is the single greatest emitter of carbon dioxide in the UK, burning more wood than any other plant in the world, as well as continuing to burn coal. Now, Drax is determined to regain its former position as the country’s top fossil fuel burner, too: it is asking for permission and subsidies to replace its two remaining coal units, which the Government says must close in 2025, with much larger gas powered ones. This would make Drax the biggest ever gas power station in the UK (without burning any less wood). 89 environmental organisations – 75 of them from the UK – have signed an Open Letter against these plans, and over 95,000 people have signed a similar petition. In return for trashing forests and digging up communities, Drax is receiving massive subsidies, when it should have been closed down years ago. Drax is cashing in on over £2 million in subsidies every single day. Meanwhile, subsidies for genuinely renewable and low carbon onshore wind and solar power have been slashed across the UK. We're a week away from Drax's AGM, where Biofuelwatch activists be holding a colourful and noisy protest. This year, Drax's AGM will be back in London. 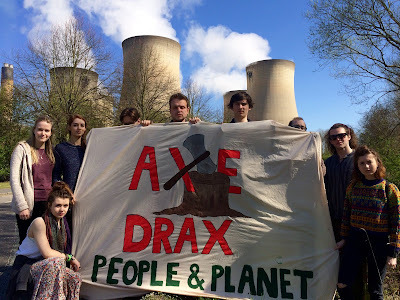 Biofuelwatch will be outside with banners, music and speakers to call out Drax's forest-destroying biomass, its burning of coal, and its mega gas power plans. A colourful and noisy protest with music and speakers. Bring your own banner if you can! Please write to your MP to demand the government Scrap Biomass Subsidies. £1 billion a year is wasted in burning wood, which should go to genuine, low-carbon, no-burn renewable energy. Follow Biofuelwatch on facebook and twitter! "The Green New Deal must be developed in transparent and inclusive consultation ... and partnership in recognition of the sovereignty and self-determination of federally recognized American Indian and Alaska Native Tribes and villages including all ...rights secured under treaties, statutes, executive orders and federal and state court cases. These projects will also include ...Native Hawaiian organizations and State recognized Tribes. Acknowledge the ... Tribes that develop ... their own Free, Prior and Informed Consent laws [for] Indian Country, inclusive of their lands, waters, territories and resources; and off-reservation hunting, fishing, medicine gathering, food gathering, cultural and spiritual practices..."
The U.S. military is responsible for the worst and most widespread pollution on earth, yet this goes unreported by corporate media and unaddressed by U.S. environmentalists. It wasn't the focus of restrictions at the UN Climate Change Conference. Global operations of the U.S. military (wars, interventions, over 1000 bases around the world and 6,000 facilities in the U.S.) aren't counted against U.S. greenhouse gas limits. 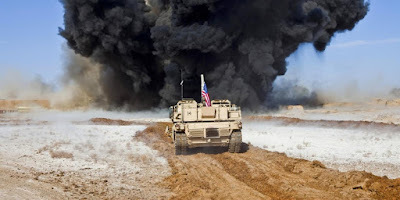 According to Steve Kretzmann, director of Oil Change International, "The Iraq war was responsible for ...more than 60 percent [of the emissions as] that of all countries. . . . [M]ilitary emissions abroad are exempt from national reporting requirements under U.S. law and the UN Framework Convention on Climate Change." So people in the U.S. must struggle to keep hydrocarbons in the ground, resist U.S. militarism, and uphold the sovereignty of indigenous people. This includes offering concrete alternatives, like the Mutual Aid centers in Puerto Rico, or the clean water programs supported by Puerto Ricans in Action in Los Angeles, to recovery efforts controlled by U.S.NGOs and the military. Puerto Rico is as damaged, ongoing, by U.S. colonialism and disaster capitalism, as by Hurricane Maria. That's why the Puerto Rican Federation of Teachers, in the documentary "Lucha Si!" and in their daily organizing, make it clear that decolonization and Puerto Rican sovereignty is the solution to the privatization of schools being imposed under the colonial government's austerity programs and the U.S.-imposed "PROMESA" financial junta that controls the island nation's finances in order to prioritize repayment of debt to vulture capitalists. On the occasion of getting the PR Department of Education to reverse the closing of several schools, Mercedes Martinez, the union president, said, "Everything is possible, if we fight. More than ever proud to have been arrested with 20 comrades for defending public education." One positive aspect of the local proposal is that it does identify the need for mutual aid projects as a basis for organizing. As the threat of climate change increasingly becomes the deadly reality, we cannot afford to leave survival to the right-wing or racist survivalists. The left must step up to promote anti-racist collective common solutions in the process of uprooting and replacing the system that is to blame. "Survival pending revolution" was the basis for the Black Panther Party survival programs, and such efforts are needed more than ever today, to hasten the day when massive reforestation and restoration of grasslands and wetlands destroyed by capitalism and colonialism can begin to restore the natural carbon cycle. To de-carbonize, we must de-colonize. What Now for the Green Party? The Green Party seems to be taking increasingly desperate measures to justify its existence. Yet climate change is now recognised, almost universally as the most serious issue facing humanity – so why the anomaly? As usual, to quote Harold Macmillan, its “events, old boy”: in this case the events put in train by Corbyn`s rise and Brexit. Both, I would say, compounded, by the origins and social composition of the Green Party itself. During the Blair years the party started to break out of the old Ecology Party niche, with its emphasis on lifestyle choices, and opposed not only the Iraq war but New Labour`s economic policies. After the 2008 financial crash and the election of Caroline Lucas as the first Green Party MP, this process accelerated and attracted many who had been politically homeless in the face of the New Labour/Tory/LibDem consensus for globalisation, privatisation and austerity. Many were former Labour Party activists and by 2015 the party had its best ever general election result – fought on a social justice and anti-austerity agenda and membership peaked at 68,000. Some say that the success of this Green Surge helped to open the door for Corbyn. 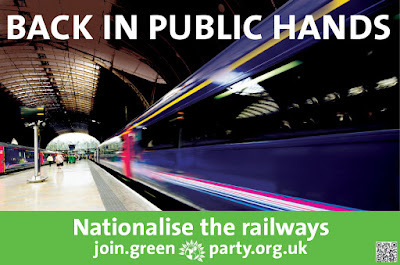 Most of the Green Party's policies of 2015 were in Labour`s 2017 manifesto and most of the activists who joined the Green Party from Labour returned to work for a radical Corbyn led government. 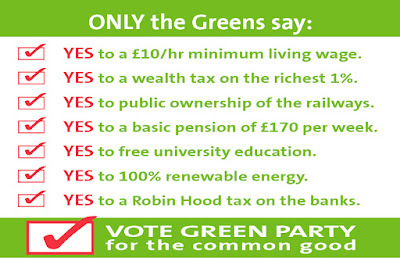 The notion that such a government was now a real possibility focused the minds of many other Green Party members. Was supporting Labour now a more realistic vehicle for radical social change than just voting Green? Obviously Labour had the potential to be more effective, but only if the left won the battle in the party and its green policies were to be extended, prioritised and implemented. In spite of these caveats many did decide to join Labour (some saying they did so with a heavy heart). Nearly 40,000 left the Green Party during 2017/18 including many experienced activists and people who had held key positions on leading bodies. 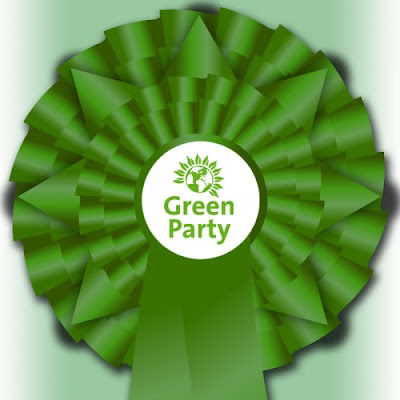 The current membership of around 36,000 reflects a more recent influx – mostly people attracted by the Peoples Vote on Brexit stance of the Green Party leadership. In 2013 the Green Party conference decided to define the party “as a party of environmental and social justice, the two elements being inseparable”. The loss of many on the left of the party since 2016 led to calls to “go back to our core roots” ie scrap the social justice dimension. The days when Natalie Bennett could tell conference “ask not what the trade unions can do for us, Ask what we can do for the trade unions!” were over. The leadership were in a bind, unsure of how to position the party and it was clear that a difficult period lay ahead. This was to be amply confirmed at the 2017 general election when the Greens lost 700,000 votes, mostly to Labour. But in 2016, with Caroline Lucas back again as leader, the party concentrated its efforts on a “Yes to the EU” campaign for the Brexit referendum. This was a shift from the historical position of favouring localism “think global, act local” over ceding control to centralised, unaccountable blocs. In fact the party was largely eurosceptic from its foundation – until 2016! The Leave result in the EU referendum was entirely predictable; the government having handed voters a cudgel, millions took the opportunity to bash them with it – for reasons often unconnected with Europe. This is where the class nature of the Green Party comes in. The party has a far higher proportion of academics, professionals and middle and upper class members than any other party – the very people who were horrified by the result. Some could hardly believe it, saying their lives were shattered whilst others thought about leaving the country. So no big surprise that the party piled onto the “Peoples Vote” bandwagon with enthusiasm, making it a top policy priority. This call for a second referendum confirmed the widely held view that the establishment wanted endless votes until the people “voted the right way” - as had happened with EU votes in several countries in the past. 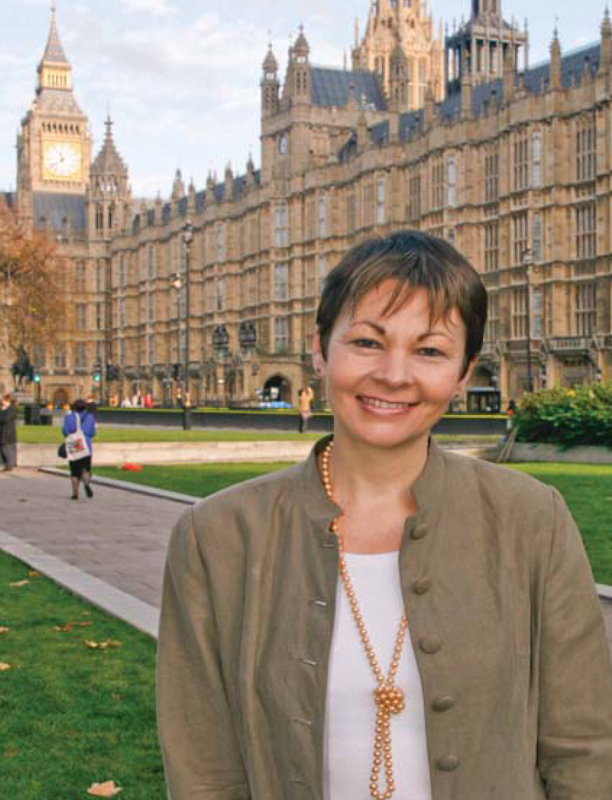 Countless people have been inspired by Caroline Lucas who never seemed to put a foot wrong in her approach, her media appearances or her analysis. She still has wide public respect and will probably become a “national treasure” but the shock of Brexit resulted in a series of missteps and strategic errors. The Green Party seemed locked into a period of panic reactions to events – backing the divisive “Peoples Vote” campaign; panicking over anti-semitic allegations; not defending party democracy in the face of attacks by “identity politics” militants - and moving heaven and earth to make sure the Urgent Holistic Review (HR) proposals to change the Green Party structure took effect. The 2018 Autumn conference spent more time wrangling over internal party organisation than debating the political challenges facing the party. The membership at large had little or no interest in the HR rigmarole or the referendum to agree the changes. Party staff and resources had to be fully mobilised to harvest enough votes for a 16% turnout and avoid an “egg on face” outcome. The Green Party has some of the trappings of an NGO including a well paid CEO and a culture tending to favour outsourcing of tasks to “professional” companies and fundraisers rather than using the skills and expertise which many members have offered voluntarily. These same members are bombarded with financial appeals to support a head office bureaucracy whose internal workings are pretty hit and miss with constant changes in staff and systems. A review to make the party more efficient and member friendly would be a good idea but the HR is almost the exact opposite. Decisions on political activities will be centralised in an 11 member Political Executive (PEX) and the Board of Directors of a limited company will deal with staff, finance and day to day functions. A 45 member Council will take on all the work done by committees currently dealing with policy development, conferences, publications and campaigning and international affairs. Only a dozen of these 61 posts will be directly elected. This adds up to centralisation of control by the party leadership and bureaucracy. Members have described the abolition of the International Committee as “Our Very Own Brexit” as the changes do not accord with the rules of the European Green Party. The first fruits of the HR decision making process were not long in coming. In early 2019 a “WinterFest” was held to review policy and discuss possible conference motions. More of these forums are in the pipeline with the distinct possibility that Spring conference will be ended or downgraded. This is all too reminiscent of New Labour under Blair when policy forums, attended by a minority of councillors, wonks and spin doctors made policy and conference became little more than a rally. Labour have now scrapped the forums in favour of more democracy and a much more democratic conference. A new Green Party Political Strategy document says “research on the 2017 general election has shown that the party does not “own” an important and popular policy in the eyes of the electorate. We will undertake further research to help us identify which of our policies might fill this gap”. If only we had George Orwell to comment on these immortal lines! A Green Objectives section defines the key objectives as environmentalism and “social liberalism” - a slippery term to replace “social justice”. Then we have the Strategic Objectives which include overtaking the LibDems to become the third most popular party; increasing councillors to 300 (out of 14,000 ! ); retain the Green MP; poll 1,000,000 at the next general election and reach 80,000 members by 2022. This wish list puts the party only slightly ahead of where it was in 2015, yet by 2022, on worst case scenarios, we will be only 8 years away from unstoppable climate breakdown. Many people thought that the Urgent Holistic Review would be confined to organisational tinkering but it has become clear that such a root and branch reorganisation reflects a political reorientation. The main activity of the Green Party has always been electoral and, with no prospect of more MPs in the near future, the party is now focused on competing with the LibDems – in mainly Tory held local council seats. If the motley crew of Blairites,Tories and Labour rejects of the “Independent Group” manage to contest local elections, they will also be competing for the same ground. All members have had an appeal from HQ assuring them that they would have to do nothing more than sign their name to become a “paper candidate”. The hope must be to contest enough seats to keep up the appearance of still ranking as a player. 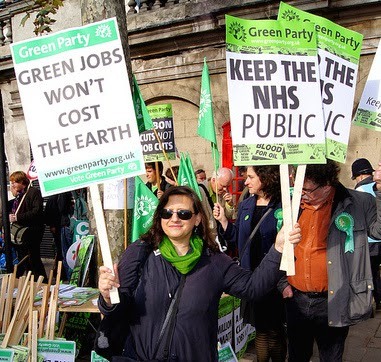 More generally the party is concentrating on “green thinking” people who are really concerned about climate change issues – anti-fracking campaigners, Extinction Rebellion etc. Taken together with the “Peoples Vote” axis, this denotes a distinct middle class orientation which inevitably moves the party in a rightward direction. No longer a social democratic anti-austerity party, but “eco-lib.dem” with councillors morphing into a band of LibDem lookalikes with a green streak. In a global context all this may seem like a sideshow at a far corner of the fair. It is, in fact, part of a pattern. The 2008 financial crash ended three decades of unstable equilibrium for the world economy and we entered a new era of uncertainty which has been described as a “post-modern” variant of the 1930s. In Europe opposition to austerity and the rise of populism has led to the near collapse of opposition parties identified with the Establishment. This includes Green parties in France, Italy, Greece and elsewhere. The Irish Greens are only starting to recover from their wipe out after entering Coalition with austerity parties. In the 2018 Swedish general election the Green party lost 10 seats (down to 15) whilst the Left party gained 7 seats (up to 28). Where the Greens and the Left are united, substantial gains have been made. In the Netherlands local elections the Green Left topped the poll in several cities and came second in Amsterdam. In the European parliament the UK`s three Green MEP`s are in the Nordic Green Left bloc and know better than most that the “Another Europe is Possible” campaign most closely resembled official Green Party policy. Yet in the Brexit debate the party seemed joined at the hip with the official Remain campaign. Even worse, the party leadership later made common cause with, and appeared on platforms with, leading LibDem, Tory and Blairite Labour MP`s, calling for another referendum – identifying the Green Party as part of the Establishment. Personally, I voted Remain, mainly in disgust at the xenophobia whipped up by the Leave campaign and sections of the media. There is another side of the story though. I have an old friend who lives on a large ex-council estate where austerity has inflicted an almost Dickensian level of poverty, where people are literally starving and where little kids rummage in bins for food before they go to school. He told me that he had never seen such solidarity and community spirit on the estate, as the residents turned out to vote Leave. After being ignored for years, with nothing left to lose, here was a chance to “stick it to the man”. A pretty well heeled crowd of people, draped in EU flags, later told them they were wrong, illustrating both the divisive nature of Brexit and the distraction it has been from the real issues. The Green Party is not alone in facing an uncertain future – the other parties being equally at the mercy of unknowable events. Nevertheless we can be certain that concern about climate change will mushroom as people move from being aware to being scared and there will be a wider and more receptive audience for the Greens. Unfortunately, the Green Party has been particularly prone to attract those who regard membership as another item to add to their green portfolio, and after a bit of box ticking, they play no further part in party deliberations or activities. 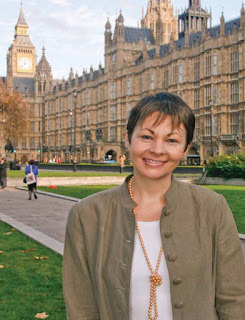 Caroline Lucas has described the Green Party as “necessary but not sufficient” stressing the need to engage with co-thinkers in parliament and campaigners outside. This is truer than ever. 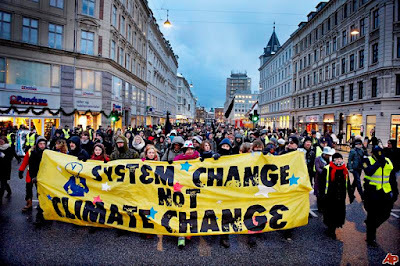 The climate crisis can be only be tackled at government level and with countries working together on a global scale and, if humanity is to have a future, an end to the capitalist model of never ending exploitation of resources to maintain constant growth. Bearing in mind the timescale this seems a tall order but we can only do what we can. For now this must include supporting the election of a Corbyn led progressive government while working with those such as Red Green Labour who are raising the profile of climate change and economic growth issues within the Labour Party, and demand that a future Labour led government will lead the move towards green policies.